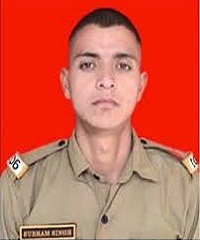 Rifleman Subham Singh hailed from Mukand Pur Choudharian village of Tehsil Marheen under Kathua district in Jammu and Kashmir. He was recruited into 15 JAK Li of the J&K Light Infantry regiment known for its brave soldiers and various battle honours. 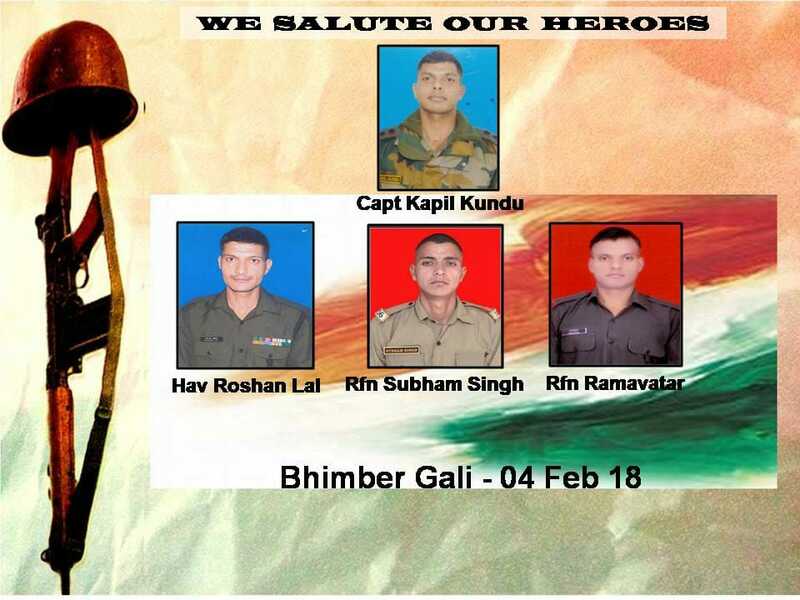 During 2017-18, Rifleman Subham Singh’s unit was deployed in Rajouri district of J & K.
India shares a 3,323-km border with Pakistan, of which 221 km of the IB and 740 km of the LoC fall in Jammu and Kashmir. The LoC is highly active and volatile where ceasefire violations occur very often and without any warning. The year 2017, recorded the highest number of ceasefire violations in the past decade resulting in the death of 35 people, including 19 army personnel and four BSF men. 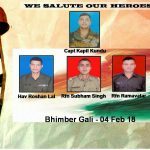 In another case of ceasefire violation, Pakistani troops opened unprovoked fire in Bhimber Gali sector of Rajouri district along the LoC on 04 Feb 2018. On 04 Feb 2018, at around 3 pm Pakistan Army troops initiated unprovoked firing on Indian posts from across the border in the Bhimber Gali, prompting the Indian troops guarding the LoC to retaliate strongly and effectively. The forward Indian posts which came under attack were being manned by the troops of 15 JAK Li. The firing was not only limited to small arms or mortars, but they also used anti-tank guided missiles (ATGMs) in a bunker-busting role. The attack was very heavy and prompted the civil administration to close all 84 schools in Rajouri district as a precautionary measure and also activate their emergency evacuation team. Indian Army gave a befitting reply and a fierce cross-border exchange of fire ensued. During this heavy exchange of fire Rifleman Subham Singh, who was on duty on one of the forward posts got seriously wounded along with three more soldiers of his unit. He later succumbed to his injuries and was martyred. Rifleman Subham Singh was a committed soldier who laid down his life in the service of the nation. Rifleman Subham Singh is survived by his father Parshotam Singh. Lots of respect for you, Sir. Love and strength to your family. Rest in peace. Your sacrifice is truly inspirational. My deepest respects to your family.